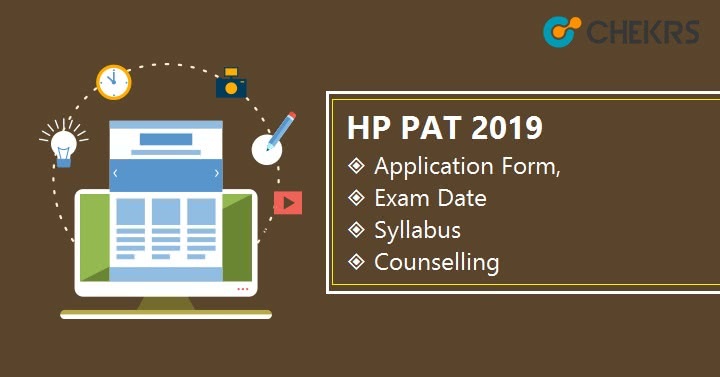 HP PAT 2019: HP PAT is a state level exam to get admission into first year & lateral entry of various Diploma courses. The Himachal Pradesh Polytechnic Admission Test 2019 (HP PAT) will be managed by the HPTEB, Dharamshala. Interested candidates can get admission in various government and some private Polytechnic institutions in the state of Himachal Pradesh. In this article, we are going to explore details of HP PAT 2019 Application Form, Exam Date, Syllabus and much more. All the interested aspirants should check the HP PAT 2019 eligibility criteria before filling the application form. The aspirants should belong to Himachal Pradesh state. Interested candidates must have passed 10th or equivalent exam with 35% aggregate marks from HP Board or any recognized board. Candidates have passed their previous examination with Mathematics, Science and English subjects. Candidates who are appearing (secondary standard) in above exams can also apply. If you are eligible for HP PAT 2019 then you can move to the next part which is HP PAT 2019 Exam date. Here we are providing all the tentative dates of HP PAT 2019. All the candidates are requested to check the official website on a regular interval to live updated about the HP PAT exam. The Application form is expected to be available online from 3rd week of April 2019. All the interested candidates have to fill the HP PAT 2019 application form online. Before that, make sure to read the HP PAT 2019 Prospectus. Candidates can fill the form till the 2nd week of May 2019. All Candidates can pay the HP PAT application fee either through online mode or through offline mode via any SBI bank Challan. The application fee will be Rs. 650/- for general category candidates. HP PAT 2019 Application Fee for OBC/SC/ST candidates will be Rs. 400/-. Candidates need to visit the official website of Himachal Pradesh Takniki Shiksha Board. On the home page of the website you will find ‘Polytechnic-PAT 2019’ option, click on it. You will be redirected to the ‘New User Registration’ page. Now you have to Enter all the required registration details. After filling the exam form click on ‘Submit’ button. Now Login to the page using received user ID and password. Find and click on ‘Apply Online’ to fill all the required details. Candidates have to fill all the details which are asked in the HP PAT 2019 Application form. After filling the application form, Check all the details. click on ’Save & Proceed to Next Step’ Tab. After it, you need to upload the scanned photograph and signature in the JPEG format with size less than 100 kb. After uploading all the images, click on ‘Next’ and pay the application fee by selecting any mode. Here we are also providing HP PAT 2019 Exam Pattern. The exam will be conducted through offline mode. The paper will have 150 objective Questions. 1 mark will be deduced for each wrong response. The HP PAT 2019 syllabus will be prepared from the subjects such as physics, chemistry, mathematics, and English from class 10th syllabus. Candidates can start their preparation form the NCERT syllabus. No. of Questions from each subject is listed below. HP PAT 2019 admit card will be available from the 3rd week of May 2019. The admit card in pdf format can be downloaded from the official website. To download the HP PAT 2019 Hall Ticket candidates have to go to the official website, and then they have to go to the login page. On login page they have to Login, using their valid Login id and password. After it, they have to enter Captcha Code, and then click on login button. On the next page click on download admit card button which will be available in the Check Application Status window. The HP PAT result 2019 will be declared through online in the last week of May 2019. Candidates have to go to the result page then they can check their result by entering the application number or date of birth. The exam authority will also release the answer key of the HP PAT 2019 Examination in the fourth week of May 2019. A separate merit list will be also prepared and released by the exam authority on the basis of HP PAT 2019 Result. There will be multiple rounds depending upon the availability of seats in the Counseling. The counseling process will be started from the first week of June. The HP PAT Counselling 2019 will be conducted through online mode but if seats will remain vacant then a centralized offline counselling will be also conducted. HP PAT 2019 is a state level exam to get admission into first year & lateral entry of various Diploma courses. If an eligible candidate is interested in this examination then they can fill the application form before the due date. To know the exact dates and events of HP PAT 2019 candidates have to check the website and exam notification regularly.